950518/Toy-Review/Guess-Who.htm180Guess Who?321654651641Play the original mystery face-guessing game and have hours of guessing fun! Eliminate the wrong faces to guess who's on your opponent's card! 2 players<table border="0" cellpadding="0" cellspacing="2"> <tbody> <tr> <td>Age</td> <td class="specValues">5-12</td> </tr> <tr> <td>Made in</td> <td class="specValues">China</td> </tr> <tr> <td>Recalls</td> <td class="specValues">No</td> </tr> <tr> <td>Batteries</td> <td class="specValues">None</td> </tr> <tr> <td>Materials</td> <td class="specValues">Plastic, Cards</td> </tr> <tr> <td>Choking Hazard</td> <td class="specValues">Not if used appropriately</td> </tr> <tr> <td>Date Reviewed</td> <td class="specValues">05/16/2016</td> </tr> </tbody> </table>17.99Hasbro<ul> <li>Helps with visual perception and discerning skills</li> <li>Provides opportunity to practice forming questions</li> </ul><ul> <li>Very cheap construction</li> <li>Women and non-whites are very underrepresented&nbsp;</li> </ul>2016-05-16Guess Who?6.007.004.008.005.008.003.70B00S732WJEGuess Who?falsehttp://ecx.images-amazon.com/images/I/916LTBE1S%2BL._SL1500_.jpghttp://ecx.images-amazon.com/images/I/916LTBE1S%2BL._SL1500_.jpgtrue/Files/product-images/321654651641_1.jpegGuess Who? A classic game of elimination, this toy may still prove fun for those who don’t mind how the toy’s quality has gone downhill. 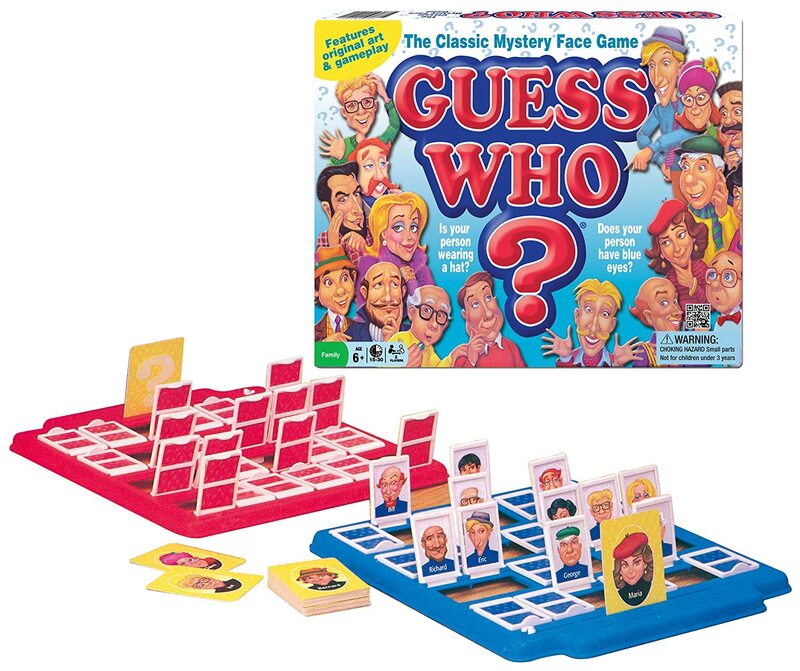 Like a game of 20 Questions, this game requires kids to determine who their opponent’s mystery person is by deductive reasoning and process of elimination. Engaging children in verbal communications and social interaction, this gives children practice visually discerning objects as well as forming relevant questions about those differences. The quality has clearly decreased, with the newer versions having thin, weak plastic that is prone to breaking. Additionally, many users have complained that this version has no non-white faces, and only five women, so users who want to avoid this problem may consider purchasing a different version, listed below in Observations. Two plastic game trays are lined with plastic flaps that hold images of faces. A deck of cards has faces that match the ones on the trays. Going back and forth in this manner, players flip down the flaps that have a face that cannot match their opponent’s card. The first player to correctly name their opponent’s card wins. Allowing children a way to practice observing visual differences between objects, this game also serves as practice for forming relevant questions. As children develop these skills, they are able to create more strategic questions, letting them more quickly solve the correct identity of their opponent’s card. Social interaction is also encouraged by this game, as children learn not just what to ask questions about, but how to form questions that the listener will understand. The manufacturer recommends this game for ages 5 – 15, but we think younger children will enjoy it more than teenagers. We do not feel that the game is challenging enough to really occupy the attention of a teen, unless they are playing with a younger child for the purpose of just spending time together. Many readers may look on this childhood game with nostalgia and fondness. Unfortunately, we hear many complaints about quality. The plastic is very thin, causing the tray flaps to pop off or break entirely. Some users have reported issues in the printing of the face cards, such as faded out colors. This results in the same person looking like they have brown hair when the other player’s card shows them with black hair, which can easily result in one child thinking the other is cheating. We also wanted to report that a number of users are disappointed in how this version of the game lacks any real diversity among the faces. There are no clearly non-white faces to be seen, and the ratio of women to men is also instantly apparent. Only five of the twenty-four faces are women, leaving nineteen as men. This means that if a player draws a woman as their mystery person, their opponent’s question of “Is your person a woman?” will dramatically skew the game in the opponent’s favor. For those who wish to purchase this game but are upset with the faces Hasbro chose, there are versions that use objects rather than people’s faces. It uses four sheets of objects: Sea Creatures, Food Items, Pets, and Vehicles. We have not yet reviewed this toy. Not applicable. All necessary parts are required. The cheap quality of this game is frustrating. It is clear that Hasbro has cut corners with product quality in order to save themselves some money, which is both disappointing and a little insulting.